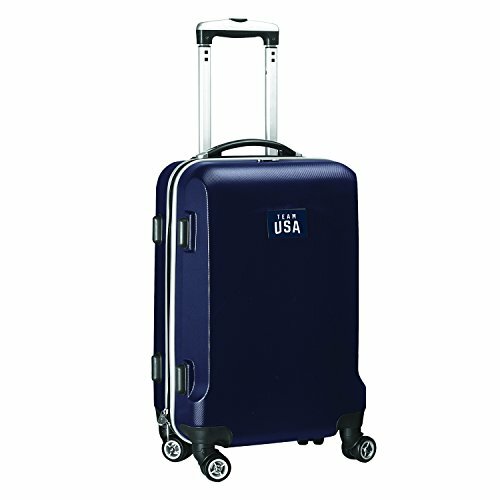 Get into the global spirit and celebrate Team USA during the Olympic and Paralympic 2018 Winter Games with this L204 Team USA Carry-On Hardcase Spinner made by Denco. It has multi-directional spinner wheels that offers incredible 360-degree upright maneuverability and 100% ABS material designed to absorb impact by flexing when under pressure then popping back to its original shape which eliminates dents and dings. It also boasts a micro diamond texture for extreme scratch resistance which keeps the case looking beautiful trip after trip. It has a fully lined interior with elastic garment straps, interior zipper pocket for delicate items and top and side handles that make it easy to lift in any situation. It is decorated with Team USA graphics so whether you are speed-skating, ski-jumping or snowboarding to the finish line, you will be sure to win the patriotic pride gold medal as you cheer Team USA to victory!